Achronix Is Latest FPGA Vendor to announce a new high density FPGA (Field Programmable Gate Array) chip. Their new family of Speedster22i HD devices have an impressive 1.7 million effective LUT (Look Up Table) cells with 138 megabits of on-chip embedded RAM. Like their competitors Altera and Xilinx, the Achronix FPGA are fully reconfigurable SRAM based devices. The three companies have similar basic building blocks in their architecture consisting of LUTs, Multiplexers, Multipliers, Logic State Flip-Flops, Carry Chains and General Purpose Memory. In addition to the core logic, the I/O contains a number of dedicated IP blocks to select different I/O standards, Serializer-Deserializer (“SerDes”), Clock Generators, Clock Recovery, Phase Lock Loops (PLL) and other user configurable elements. To implement high speed communication standards, the Speedster22i FPGAs contain up to sixty four (64) lanes of 12.75 Gbps SerDes, up to sixteen (16) lanes of 28 Gbps SerDes and up to 996 high‐speed general purpose I/O blocks. One key advantage to Achronix over their competitors is that they are “Made In USA”. As with both Altera and Xilinx, Achronix is a fabless semiconductor supplier of chips. This means that they do not have their own chip manufacturing, but rather contract this out to a third-party. 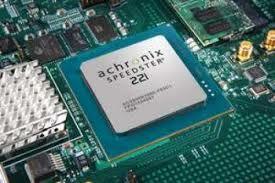 For Achronix, they have a strategic relationship with Intel to build the Speedster22i using Intel’s US based facilities. For many customers, including military, defense and medical, this means they can have a complete start-to-finish supply chain in the USA. For other customers, being built on-shore can greatly simplify supply chain logistics and ease any concerns regarding intellectual property security or design copying. It is interesting to note that both Achronix and their largest competitor, Altera, have both recently announced plans to utilize Intel for the high performance FPGAs. Using the Intel foundry will allow both companies to produce semiconductors using the latest 3D silicon transistors in what is referred to as “FinFET”. This 22 nm process creates a stacking on the silicon of 3 vertical elements which can increase the number of transistors on a device by 30% to 50%. For more information, datasheets, application notes and technical support, please visit the Achronix website .